The persistent propaganda by President Chandrika Kumaratunga and senior ministers of her People's Alliance government that the opposition United National Party is conspiring with Liberation Tigers to undermine the Sinhala nation and the opposition's efforts to deny the charge are inexorably transforming the question of ending the war into a taboo, a spokesman for the Tamil National Alliance said Tuesday. 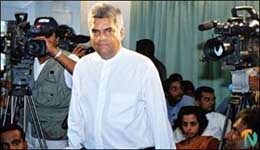 Although under election laws propganda had to stop from midnight Monday, the President continued to lambaste the UNP in an interview on the state run TV Tuesday while the UNP leader Mr. Ranil Wickremesinghe once again denied at a press conference in Colombo that his party had no secret agreement with the Tigers. "The gist of the President's accusations and Mr. Ranil Wickremesinghe's denials clearly mean that the war mongering tenets of Sinhala Buddhist fundamentalism is more important to both of them than offering the Tamils an honourable political settlement ", said Mr. Selvam Adaikalanathan, leader of the Tamil Eelam Liberation Organisation and the chief candidate of the TNA in the Vanni. "Mr. Wickremesinghe's reactions to the PA's accusations and President's vituperative Sinhala chauvinist propaganda demonstrate unequivocally that they would rather continue the war than be accused of betraying the Sinhala nation by granting a settlement to the Tamil people", he added. "If the UNP does not see any significant increase in its popularity at this election then it is going to inevitably be convinced that Sinhala chauvinism and war mongering pay. The implications of this are clear", said Mr. Pon Selvarasa, TNA candidate for Batticaloa. The People's Alliance won the 1999 Presidential elections and the 2000 Parliamentary elections without any significant Tamil support in the north and east and in the central province. The PA campaign in both elections was hinged on the claim that the opposition United National Party is insidiously conspiring with the Liberation Tigers to destroy the well being and integrity of the Sri Lankan (read Sinhala) state. The PA propaganda machinery worked overtime during the two elections to drive home the story that the UNP leader Ranil Wickremesinghe had promised to hand over the Northern and eastern provinces of the island to the LTTE. 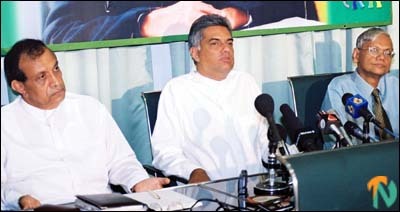 The clear implication was that the UNP was betraying the Sinhala nation and hence unworthy of Sinhala votes. The PA took up the same UNP-LTTE conspiracy story as its main propaganda weapon to deal with the crisis created by the defection of a key section of its main ally, the Sri Lanka Muslim Congress, and the No Confidence Motion by the opposition earlier this year. The PA has reached a point today where it cannot disentangle itself from the Sinhala nationalist implications of the UNP-LTTE conspiracy story. The PA is acutely conscious that even if it were to form the government, any concession to the LTTE for starting peace talks or as part of a temporary fixture could, by it's own yardstick, be decried by the opposition as a betrayal of (Sinhala) national interests. The PA's propaganda offensive against the UNP is based on the logic that de-proscribing the LTTE is an 'anti-national' act. The UNP remains committed to the unitary state. The most it would concede is a unitary state with aspects of federalism as in the Indian constitution. Given the dynamics of Sinhala populism in which both the PA and UNP are entangled, it is well nigh impossible to get a consensus in the new Parliament to amend the constitution to accommodate even basic Tamil expectations and to end the war.